Thank you very much for subscribing and for being a part of our Cloudeight family. We appreciate your membership and support very much! Reminder: To ensure delivery of this newsletter, please add our email address to your address book and / or alert your ISP should you need to have it whitelisted in order to receive this newsletter. We send this newsletter from the following email address: cloudeight-news@thundercloud.net. We're excited to announce that our new 2017 Cloudeight InfoAve Premium Volume 14 E-Book is available now. Our Cloudeight InfoAve Premium E-book Volume 14 includes all the content from every issue of Cloudeight InfoAve Premium from the past year! Hundreds of answers to your computer questions. Hundreds of computer tips and tricks for Windows 10 - and other versions of Windows. Dozens of freeware & site picks. The best of our 2017 essays. It's the E-book that can read to you! Our new E-book has a keyword search that makes it easy to instantly find what you're looking for. See how easy our new Ebook is to use; watch this short video. Our Cloudeight InfoAve Premium Volume 14 E-book is just $18. Get your copy of our 2017 Cloudeight InfoAve E-book Volume 14 today! You can read and search over 3400 Computer tips and tricks from our Cloudeight InfoAve Web site. Have tried on many occasions to update my windows 10 to the creators update and to the fall creators update with no success as it appears many other have experienced. I contacted Asus and their answer was to do a factory reset and then try updating. The problem was the screen went black at 72% and froze, rebooting restarted the upgrade at 72% and continued to 88% where the screen froze and the blue dots stopped going around. Rebooting just reverted back to the previous working version of Windows 10. I had read during my many searches for the problem and a solution that it was the WiFi card that was causing the problem, so before doing a factory reset I decided to remove the Wi-Fi card and give it one last try. The update then downloaded and installed without a problem at all and now have the Fall Creators update installed and working. I have not reinstalled the Wi-Fi card until I can find out why it caused the problem. Maybe new WiFi card, or just do without and stick with network cable. Thought this might assist others in the same situation. I want to thank you both for the wonderful service you provide. When something is free, like your site, it is so easy to click, read and close and take for granted the work that has gone into providing, on a regular basis, this wonderful site, with all its useful information, I have made up for this oversight by making a small donation which I hope will help you continue your good work. I intend to occasionally make a similar donations in the future. Thanks so much to Darcy & TC. I've used your services twice now and both times I've been so impressed! My first session, back in July, TC connected and fixed my PC - and did an excellent and professional job. Then in September, Darcy to installed Thunderbird for me - and I really like it. Much easier than going on the Web to check my various accounts. This is a long overdue thank you to both of you. You offer a great service! . Steve. Hi Darcy & TC... I would like to thank Darcy again for checking my computer on Fri. After a few emails on trying to find a day & time that we could get together when I would be off work; Darcy was willing to give up her Sat. morning to help me. When I found out that I would be off work on Fri. She was able to work me into her schedule & work on my computer in the morning. In less than an hour she had installed the new Emsisoft program & checked for virus & malware. I have been a subscriber since you folks started, and have loved every minute. Just the other day I had Darcy install Thunderbird email for me, and am very happy with the program. I have made use of a lot of your tips and you've gotten me out of a few jams that I managed to get my self into. A huge HOORAY to Darcy and TC for all of your work and great tips and how to, keep up the great work, I know I'll keep watching and making use of your endeavors. Thanks so much to: Jim, Phil, Steve, Karen, Robin, Patricia, and all of you who have taken time to write to us this week. And thanks all those who used our Cloudeight Direct Computer Care services. Also, a BIG thank you to all who have helped us with your donations and those who have shared our site with friends. THANK YOU! EB & TC. Get more information about Cloudeight Direct Computer Care here. I just bought a new Dell Inspiron 3668. I previously had the same Microsoft account login for both my desktop and laptop. I was forced to use an outlook.com login in order to register my new desktop. I still use my old Microsoft login for my laptop. Is there a way to change back to using the same login for both computers. Hi John. There is no difference between an Outlook.com log in and a Microsoft log in, so I'm not sure what you mean by you use a Microsoft account on your laptop but were forced to use an Outlook.com to register your new computer. You can use the same Microsoft account on both your laptop and your desktop. Microsoft accounts are accounts that use email addresses ending in @hotmail.com, @outlook.com, @live.ca, @live.com and @msn.com. We suggest you use the same Microsoft account on both computers. However, Microsoft does not force you to use a Microsoft account. You can log in with a local account instead, although some features (Microsoft store for instance) won't work. There are many advantages of using a Microsoft account - all features of Windows 10 work, you can change your account name online, and if you lose your password you can re-set your password online from another device. If you lose your password using a local account you won't be able to access your computer unless you create a password reset disk. We're going to show you how to create a local account, just so you know that no Windows 10 user is forced to use a Microsoft account. Just remember when you use a local account to sign in to Windows 10, some Windows 10 features won't be available. 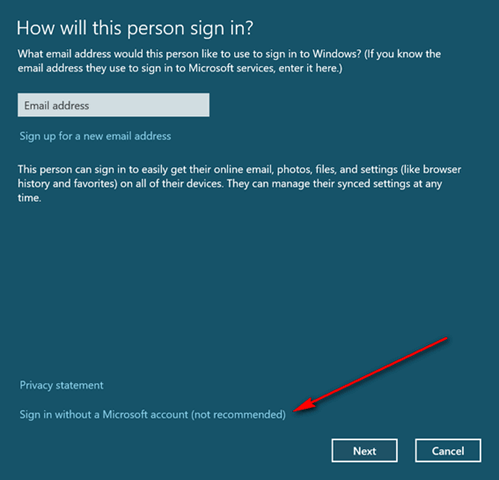 In the dialog that appears, at the very bottom click on "Sign in without a Microsoft account (not recommended)"
Then click Next and follow the instructions. You can create a local (non-Microsoft) account this way using any email address you choose. Hope this helps you, John. John wrote back: "Thank you for the your help and information. I know what to do now. John"
Fall Creators Update will soon be coming to me, and I am really worried about it. I am just so unable to follow directions as I don't understand the words and I shall probably not be able to use my computer at all. I don't have an iPhone or iPad or anything like that, and without you two I wouldn't be able to use my laptop at all. I don't know how to find how soon my Emsisoft runs out. I used to get little notices when it had done its work and saved me from problems but I don't see them anymore. Hi Dorothy. There's really not much difference when you're going from the Creators Update to the Fall Creators Update. A few minor features added, some barely-noticeable cosmetic changes, but nothing drastic - and nothing at all that should cause you concern. You'll be able to use your computer just fine after the update. But if you do update and don't like the Fall Creators Update, you can return to the previous version of Windows 10 very easily. See our tip on rolling back Windows 10, here.. In regard to Emsisoft: Emsisoft will alert you in plenty of time for you to renew your Emsisoft subscription. 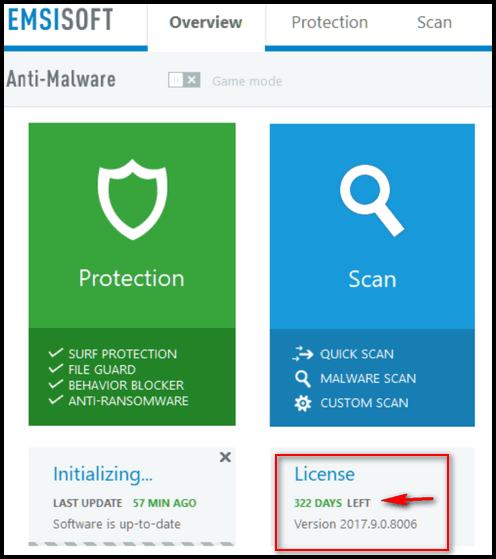 If you want to check how many days you have left, just open Emsisoft and look near the bottom under the blue "Scan" box. You'll see the exact number of days left on your license. Here's a screenshot to help you, Dorothy. Buy any Emsisoft product, renewal or installation and get Revo Uninstaller Pro 3 Free! We have obtained one more batch of Revo Uninstaller Pro 3 licenses and we won't be getting any more. So this sale will continue until we run our of Revo licenses. So don't wait - we have a very limited supply of Revo keys and won't be getting any more. We'd like to thank our friends at Emsisoft for making this sale possible! For a limited time when you purchase any Emsisoft license or renewal from our Emsisoft page, we'll send you a FREE lifetime license for Revo Uninstaller Pro 3. That's a $39 value. Revo Uninstaller has so many great features that help you completely uninstall and remove programs and apps from your Windows computer. Revo Uninstaller Pro 3 is the latest and greatest version of Revo Uninstaller - and we're giving it away free with any Emsisoft purchase from our Emsisoft page. Get the best antivirus, anti-malware, anti-ransomware protection for your computer and get the best professional uninstaller FREE. Just buy any Emsisoft product from our Emsisoft page during this limited time offer period, and we'll automatically send you a lifetime license for Revo Uninstaller Pro 3 with your Emsisoft license and information. Visit our Emsisoft page right now. HI Darcy & TC. First of all, your help over the years has been invaluable to lots of people, young and old…like me. I could go on and on with lots of accolades, but I will say it in one word…THANKS!! 1: Do I have to uninstall Revo,(I have had since 2013)…before I download Revo Pro3? 2: Through Cloudeight deals with Emsisoft , I have 458 days left at present. You say the license renewal into the program within 11 months of your order date or it will expire. When would my 11 months start from? Or do I just lose those days? Hi Bob. Emsisoft licenses must be used/activated within 11 months of the purchase. Adding a license to a current one does not extend it; it replaces it. You cannot extend a license by adding a new one. You can buy a license now, hold on to it for up to 11 months and then add it when (or just before) your current license expires. On Revo Uninstaller Pro: You do not need to uninstall your current version - just let it update to newest version. Thanks for being with us through the years, for you friendship and support, and for your nice comments too! Hi Norma. We looked on our Windows 10 computers (Fall Creators Update) and found that Bradley Hand ITC is installed as a default font with Microsoft Office. Since it is included with MS Office, we zipped it up and uploaded it for you so you can download, unzip and install this font on your computer. Just click this link to download the Bradley Hand ITC font zip file we created for you. Hello folks: Following your last emailed tips, I tried to update to win 10 version1709 as suggested. I am running a desktop and a laptop. Let me explain that both computers are running Version 1703. Now, I updated the laptop no problem, but when I tried the same on the desktop I got the most unusual message, which said. "this PC is running version 15** we will upgrade to version 1699 which is the latest" so I promptly said no way and tried the download twice more and each time I get the same result. Do you have any idea what the heck is going on?. Laptop upgrades OK, desktop screwy! Version 1507: The very first release of Windows 10. It was released on July 20, 2015. Version 1511: This version is also known as the November update. It was released on November 12, 2015. Version 1607: The version is known as the Anniversary Update. This update was released on August 2, 2016. Version 1703: Also known as the Creators Update. It was released on April 11, 2017. Version 1709: Known as the Fall Creators Update, this update was released on October 17, 2017. Since we have not looked at your PC to see where these odd update messages are coming from, it certainly does not seem that they are coming from Microsoft. So you should be very cautious and try to find out where the messages are originating. If you want to upgrade and be safe, you should upgrade manually by following the instructions on this Cloudeight page. Let us know if you need more help, Vic. I am reading all your tips about the Fall Creators Update but I didn't get it yet. Did Microsoft skip my computer for updating? Hi Helen. The Fall Creators Update started rolling out on October 17 (just over 3 weeks ago). There are hundreds of millions of Windows 10 users, and it will take several months before everyone gets the update via Windows Update. Anyone who has not yet gotten the Windows 10 Fall Creators Update, can update manually any time they want to, by following the instructions posted here. I can only guess that a lot of your customer's are older or retired and enjoy learning new things on the computer or perhaps have a lot of time on their hands and enjoy playing games and see entertaining things on the Internet, but are to scared to search around because of virus, malware, etc. So maybe a section could be devoted to " Fun or Entertainment Site of The Week". Perhaps things like safe Game sites, Cooking Sites, Shopping for best deals, etc., etc., might be fun for a change of pace. Hi Sandy. It sounds like a great idea to us, What about it, readers? What do you think of Sandy's idea? Please let us know. Would you like this to be an occasional feature in our newsletters? You can chime in on this idea by visiting this page. Thanks so much for your kind words and for your suggestion, Sandy! We have had a lot of people asking us how they can find out if they have the Fall Creators Update installed. Well it’s really easy. If you see "Version 1709", you've got Windows 10 Fall Creators Update installed. If you see "Version 1703", you've got Creators Update installed - but you've not installed the Fall Creators Update yet. It may take a month or more before you get Fall Creators Update (Version 1709) from Windows Update. You can manually install it if you don't want to wait, see this page. 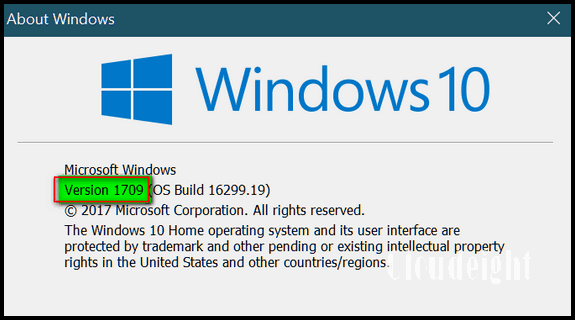 If you see Version 1607 you've got Windows 10 Anniversary Update installed. If you want the Fall Creators Update you will have to install it manually. To manually install the Fall Creators Update, visit this page. 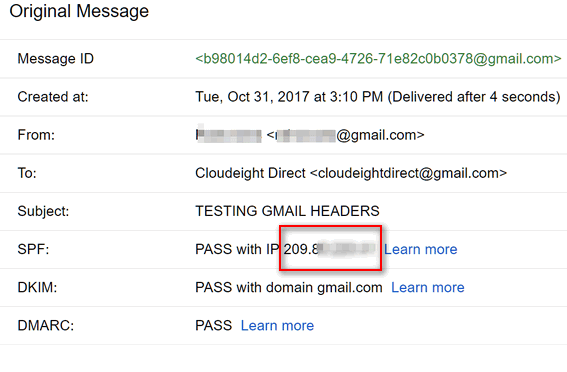 If you've ever wondered how to view the properties of an email you've received by Gmail, and you view your mail on Gmail.com, here's an easy way to see the complete headers and properties of any email. From your inbox, select any email of which you want to view the properties. Look right above the email, to the far right (to the right of the email time and the return arrow). Click on the down arrow ( below in the red box) to expand the drop down menu. 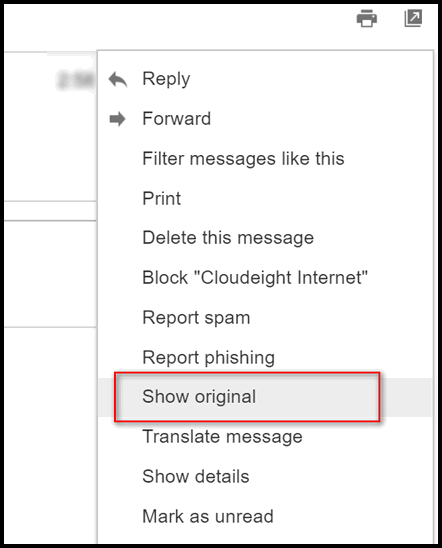 From the drop down menu, click on "Show original" (see image below). When you click on "Show original" you'll see the following. It will show the sender's name, email address, time and date of the email and other information. It will show an SPF record. This SPF has nothing to do with sunscreen :) . This type of SPF record is a type of Domain Name Service (DNS) record that identifies which mail servers are permitted to send email on behalf of your domain. You'll also see information about DKIM and DMARC. You're probably not going to be too interested in those, but if you are and you want to learn more about them you can click on the "Learn more" links when you're viewing this information on Gmail. If you can't wait, you can read more about DKIM here; you can read more about DMARC here. Beneath this information you'll see two buttons. One says "Download Original" and the other says "Copy to Clipboard". They both give you the same information... that is the complete email, headers, properties, and body of the email. They way they are delivered to you differs. If you click on Download Original a text document with all the email headers, properties, and message body will be downloaded to your computer. If you choose Copy to clipboard, the entire message headers, properties, and message body will be copied to your clipboard. You can then open up Notepad, WordPad or any word processor and paste the contents of your clipboard to it by pressing the CTRL + V keys. Having the headers and properties of your email can help you identify spam and phishing emails, but they're not easy to decipher and spammers and criminals can fake headers - but they cannot completely hide the email's origin. With a little reading and learning, you can use the information in headers & properties to find out more about who sent it and where it came from. If you’ve updated your Windows 10 PC to Windows 10 Fall Creators Update and you like emoji, you’ll like this tip. 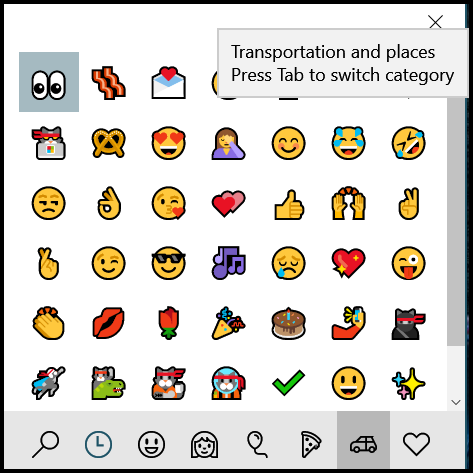 In previous versions of Windows 10, emoji were located on the Windows 10 onscreen keyboard. In Windows 10 Fall Creators Update, they’re available just by using a Windows key shortcut. 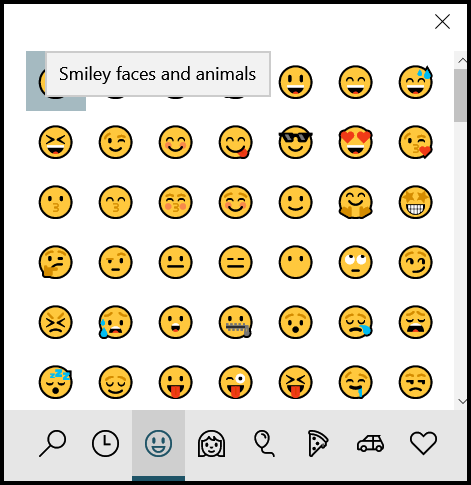 To access the Emoji pad (our name for it - not official ) on Windows 10 Fall Creators Update, just press and hold down the Windows key and tap the . (period) key. Most categories are scrollable; there are a lot more emoji available than you can see in the screen shots above. All you have to do to open the emoji pad is press the Windows key plus the . (period) key. Your Emoji pad should work now; if it does not, try changing the country/region to the United States also. Many of you now have the Windows 10 Fall Creators Update. And every time Windows has a new major version update, we get questions about the Windows.old folder. The Windows.old folder is created when you upgrade from one version of Windows to another. It was introduced way back in 2007 with Windows Vista. The Windows.old folder contains all the files, programs and data from your previous Windows installation. In Windows 10, the Windows.old folder makes it easy for you to roll back a major Windows 10 update (like Creators Update, Fall Creators Update) to the previous Windows 10 version without losing any data, programs or settings. Think of the Windows.old folder containing everything needed to go back to your previous version of Windows. It includes everything from your installed programs, all user accounts, all Windows system files, all users’ files and folders, etc. Everything you need to roll back to a previous version of Windows is stored in the Windows.old folder. Windows 10 keeps your Windows.old folder intact for 30 days after a major version upgrade. While Windows 10 keeps the folder intact for 30 days, you can only use it to go back to a previous version of Windows 10 for 10 days after you update. If you're interested and adventuresome, you can also look inside the Windows.old folder and extract individual files from it. As you might guess, the Windows.old folder can be quite large – 20-40 GB. So, it does take up substantial hard drive space. For 10 days after you install a major Windows 10 update, you’ll see the “Go back to the previous version of Windows 10” option in Settings > Update & security > Recovery. 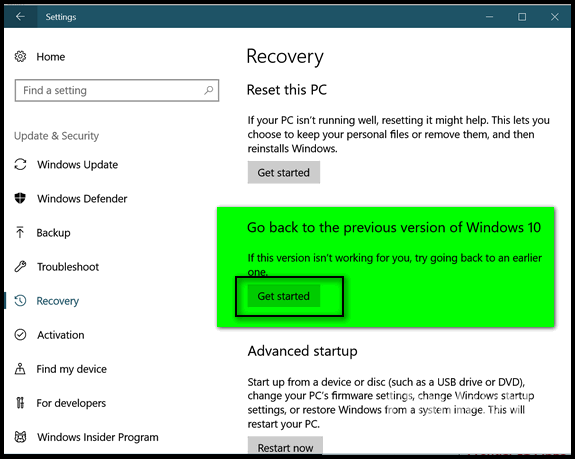 If you choose the option to “go back to the previous version”, your computer will be restored to the previous version of Windows 10 and all your programs, files, settings, etc. will be exactly as they were before you installed the update. If you remove the Windows.old folder you will not have this option. Windows will automatically remove the Windows.old folder after 30 days, but you'll only have the option to "Go back..." for 10 days after you update. If you want to remove the Windows.old folder manually, you’ll find you can’t just open File Explorer and right-click on the folder and delete it. Windows won’t let you. You can manipulate the folder’s security options and delete it, but there’s a much easier way to do it. In Windows Search (Cortana) in the taskbar, type Disk Cleanup and press Enter (or click it) when Disk Cleanup appears at the top. 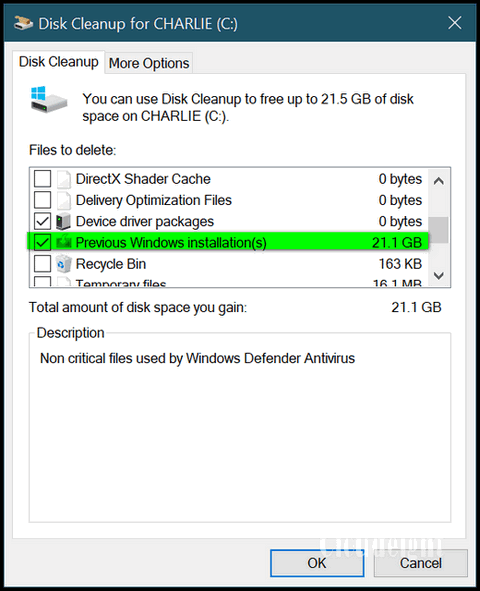 When Windows Disk Cleanup appears, you’ll see a dialog asking which drive you want to clean up. It will default to C: drive, and that’s fine. Next, click OK to let it scan your C drive. It will take a few seconds to scan your C: drive. 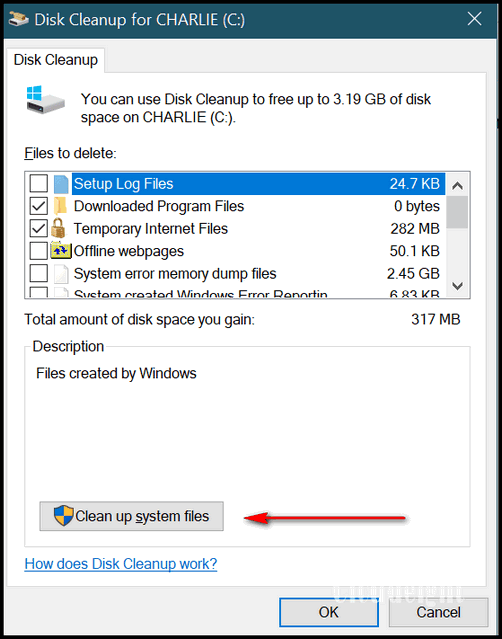 When it’s done it will show you a list of files that you can clean using Disk Cleanup. But don’t worry about that now. Near the bottom of that dialog you’ll see a button that says “Clean up system files”. Click on that button. Again, Windows will ask drive you want to clean up, it will default to “C”. Leave it set to drive C and click OK. Wait a few minutes for Windows to scan your drive. When it’s done you’ll see another dialog. You’ll need to scroll down until you see “Previous Windows installation(s)”. Tick the box next to it. And then click OK. Windows Disk Cleanup will begin the process of cleaning up and removing the Windows.old folder. Be patient. It will take some time to clean up the files and the Windows.old folder. Warning: Remember that the Windows.old folder not only contains your previous version of Windows, it contains all your personal files and settings from your previous installation of Windows including: installed programs, all your files and folders, your personalized settings, Windows system files, etc. So be very careful. Remove the Windows.old folder only when you are certain that you don’t have any problems with the new Windows 10 version update before you delete the Windows.old file — or you will have no easy way of going back to the previous version of Windows. When you drag and drop using a left-click you have only limited options. 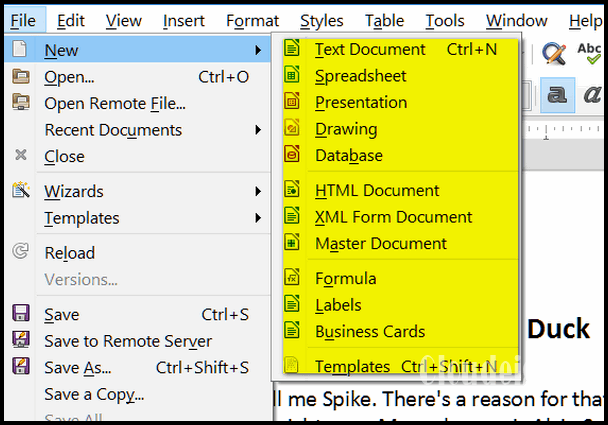 When you drag and drop using right-click you get a context menu that allows you to choose from several options. Right-click; drag and drop is the way we move files around because of the additional options. Try it; we’ll bet it becomes your preferred way of moving files or copying files as well! When you hold down the Shift key and right-click and item you’ll get an expanded menu of options. The number and kinds of options depend on the type of file you’re right clicking. Simple, easy, Windows tips that are very simple and very useful. Use Gmailify to link another email account to your Gmail account. Learn another way to fix corrupted Windows system files. We show you how! Don't forget to vote in our Fall Creators Update Poll! Interested in making a automatic monthly gift? Visit this page. Help us keep helping you! One of the most often asked questions is “What free office suite to you recommend?”. Well, there are a lot of good ones, OpenOffice comes to mind. But today, we’re featuring Libre Office Portable. LibreOffice Portable is a full-featured, free office suite which can create and open almost any Microsoft Office file. And because it’s portable, you don’t have to install it. It’s a full-featured office program you can take with you. Those of you who have Microsoft Office know what a long and arduous process installing it can be. It makes hundreds of changes to your registry and it can be a pain to uninstall. Yet most people agree it’s the best full-featured office program, and certainly the most popular – even though it’s not free and remains – even with all of the new purchase options – rather pricey. If you need a full-featured office program – one you don’t even have to install – and one you can uninstall just by deleting its folders – one you can take with you, and one that is totally free, you will like the portable version of LibreOffice. It includes all of the programs of most other full-feature office suites, but this one you don’t have to install – in fact you can take it with you wherever you go. The program comes as a standalone exe file you click to extract its programs and features. You can extract it to a USB and use it on any computer. Yes – an office suite you can take with you – pretty sweet, eh EB? Just click on the LibrePortable exe files and it extract to a single folder it creates on a USB flash drive, external drive, or your hard drive. If you ever need to remove it from you computer, just delete the LibreOfficePortable folder and it’s gone. It makes no changes to your registry or your system. If you like it and plan on using it, we highly recommend that you open the LibreOfficePortable folder and right-click on the LibreOfficePortable application and pin it to your start menu, taskbar or both. Above: Libre Office Portable on an external drive – it creates one folder and everything you need is in that folder. 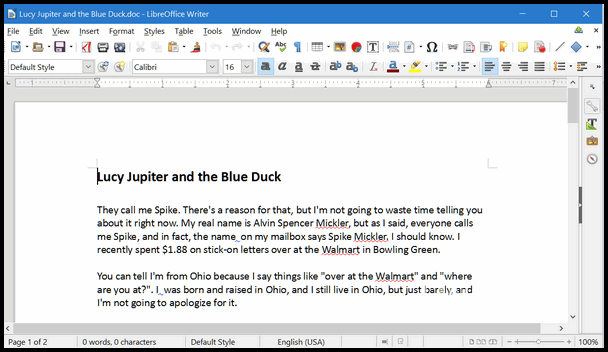 Above: A Microsoft Word document open for editing in Libre Office Writer. Above: You can create documents, spreadsheets, presentations, drawings, databases, HTML (web page) documents and more using Libre Office Portable. Above: We created a text document and we can save it as Microsoft Word (docx) or any of the other formats you see in the screenshot above. "LibreOffice Portable is a full-featured portable version of LibreOffice – including a word processor, spreadsheet, presentation tool, drawing package and database – packaged as a portable app, so you can take all your documents and everything you need to work with them wherever you go. It is packaged in PortableApps.com format so it can work with the PortableApps.com platform and its automatic updater and app store, work with other portable menus, or work by itself from a USB, cloud or local drive. And it is open source and completely free...."
OK – This is one fine free office suite. Is it as good as Microsoft Office? Nope…but it is really, really good and it is really, really cheap (free in fact). If you don’t want to give Microsoft any more of your hard earned money, but you want to be able to open and create Microsoft Office documents, we think you’ll be very happy with Libre Office Portable – the office suite you can put on a flash drive and take with you. Or just put in on your hard drive if you want. It works wherever you put it. 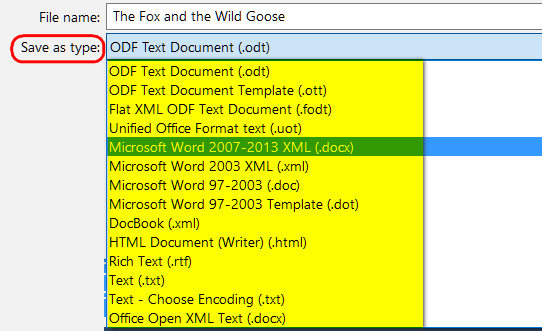 Now, go forth and read more about and/or download LibreOfficePortable. Note: If you have a slow Internet connection you might want to plan on watching a movie while this downloads – it’s around 116 MB. Just sayin’. EB thinks she is my office sweet, but she is not, I tells ya! Help us and help yourself. Our new 2017 Cloudeight InfoAve Premium Volume 14 E-book is ready now. All of the information that was featured in every issue of InfoAve Premium from the past year is included in our new ebook! It's a great reference and an excellent computer manual that can help you keep your computer running well and make you a better, more informed, computer user. Our E-book keyword search makes it easy to instantly find whatever you're looking for. Our new E-book can even read to you! Get more information and/or get our new 2017 Cloudeight InfoAve Premium Volume 14 E-book here. Here, in November, all things that grow upon the Earth choke on the cold, wet air and die unceremoniously in masses of brown death. Each November brings a pestilence of darkness. The sun goes to bed early and sleeps late every morning. The cold, nearly-frozen rain taunts the landscape, but stays just on the liquid side of snow. November will have no brightness upon its bleak gloom; it will not stand for it. On some days, November’s air has the smell of death about it and no matter what I do, I can’t help but smell it. My woodland walks grow briefer and my melancholy grows deeper; my thoughts turn from sanguine to sorrowful. I become disconsolate and sullen and spend more and more time locked away from the world in the gloomy house of shadows that is my mind. November is a month I’d rather not have to endure. Even the memories of happy Thanksgivings past cannot break or shake the melancholy of November. No barrier can stop its gales; no wall can stop its morbid fingers from strangling the flowers and trees to a cold, heartless death. Death shadows are brown and everywhere. The sun for sorrow dares not show his head. I look out and see some of the trees still clinging to life and others that have given up against the swift, sad November wind, and now stand lifeless and brittle against the never-ending, never-changing, always steel-gray November sky. Read the rest of this essay here. Modems connect you to the Internet. Without modems you would not be connected to the internet at all. Routers allow you to share one internet connection with multiple devices or computers. A Wireless Router allows you to connect multiple computers and devices to the Internet wirelessly. Additionally, most routers make your internet connection more secure with a built-in firewall. Cable and DSL modems are typically provided by your ISP, routers are not. And if back in the dial-up days, modems were built into the computer. So the modem is what connects your computer or your router to the internet -- the router makes the internet available to any devices or computers you own. Without a modem, your router wouldn't work. Wireless routers also have ports in the back into which you can plug a network cable from your desktop or laptop PC, so they'll work both wirelessly and wired. What's New in Reg Organizer 8.0? Ability to clean the Run dialog (opened using the Win + R keys combination) history. Switching between the Maximum cleanup mode and the Everyday cleanup mode in the System Cleanup tool. If you purchased or renewed Reg Organize through Cloudeight within the last 12 months, you're entitled to a free version upgrade to Reg Organizer 8.0. Premium Subscribers' Home Page. You'll find the last few weeks of Premium archived on this page. Submit your questions, comments, and suggestions for possible inclusion in our newsletters here. This form is for questions, comments and suggestions for this newsletter, not for product support, stationery questions, or general questions concerning our products or services. Get our free daily newsletter! Each evening we send a short newsletter with a tip or trick or other computer-related article - it's short and sweet - and free. Sign-up right now. If you need help with one of our software programs, have a question about an order, or have a question about any of our email stationery, screen savers, or other products - please don't use our InfoAve Questions/Answers/Tips form. Use our general Cloudeight support form instead. If you want to help us by telling your friends about our Cloudeight Direct Computer Care service, you can download a printable flyer you can hand out or post on bulletin boards, etc.. Get the printable PDF Cloudeight Direct Computer Care flyer here. Help us by using our Start Page. We have over 100 free games on our Start Page. Please use our Start Page and come and play all day. It costs nothing, and it helps us a lot.. If you have comments, questions, a tip, trick, a freeware pick, or just want to tell us off for something, let ups know. Please visit this page. We hope you have enjoyed this issue of InfoAve Premium. Thanks so much for your support and for being a Premium subscriber..
We hope you all have a really great weekend!